The Freezer Burn Fat Bike Race was a small low key race that turned out to be a fun little event. The race fields were small and included a mix of folks from all race and ride experience levels. 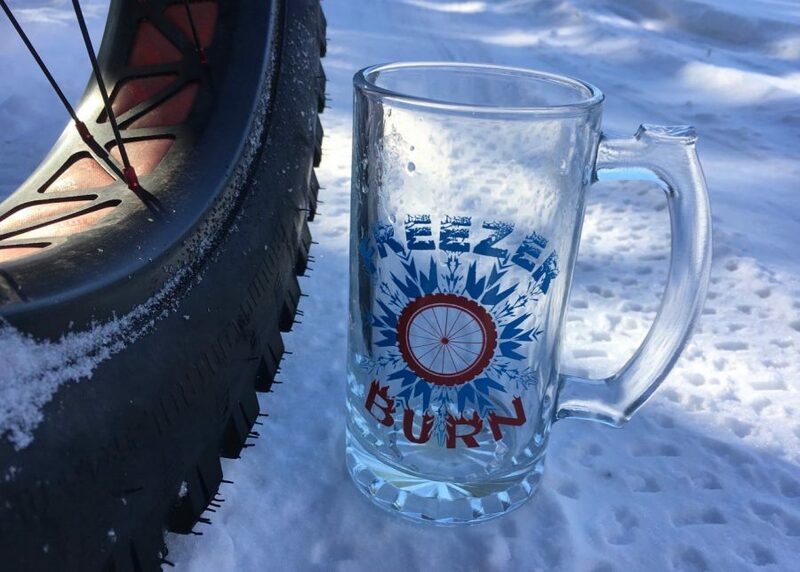 The Freezer Burn is also part of a 2 race series that includes the Fat Bike Vasaloppet in Mora, MN a month from now, also known as the Fat Vasa. The course was laid out quite nice with plenty of space to pass, while still including some tight single track with a few narrow bridges. 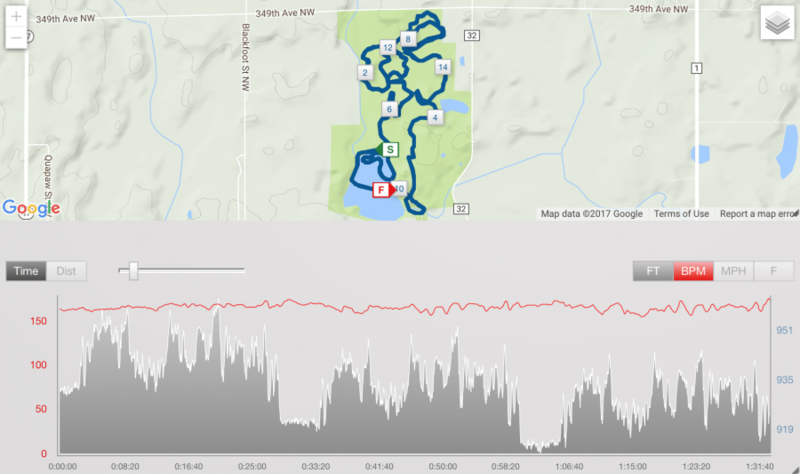 It was a 5 mile loop with the short race doing 1 lap, the middle race doing 2 laps and the long race doing 3 laps. The start of the loop included a section on the lake wide enough for passing. 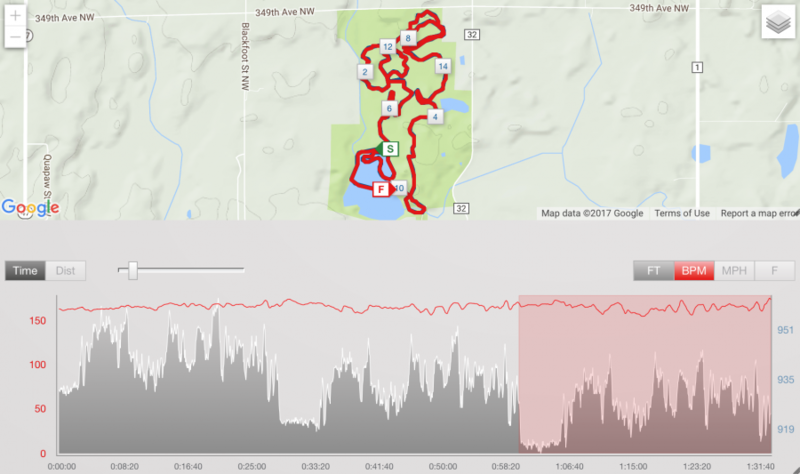 The rest of the course wove through the park on the same wide path from the lake with sections of tight singletrack mixed in. The snow conditions were a mix of hard packed to a few soft spots, particulary one on the lake that forced me off my bike on the 2nd and 3rd lap. But, it’s not a fat bike race without getting your boots in the snow anyways. It was a great course layout and the crew did a good job getting it prepped after all the fresh snow that came down earlier in the week. I started about 3 rows back, so probably near the back. I thought there were about 15 to 20 of us and the results show 19 racers in the 3 lap race. We started out with a drop down onto the ice through some soft stuff that forced a few feet to the ground. I actually can’t remember if I had to touch down or not, but I think I stayed on the pedals. The pace wasn’t crazy on the lake, but it was fast enough for a pack of folks to get away with a few individuals chasing each other off the front. This didn’t leave too many of us left off the back as we were in chase. I managed to catch the back of the main pack near the end of the lake loop, but this pack started to split apart as we worked our way through the trails. My legs really started feeling heavy and fatigue seemed to be loading up quick. My quads were still worked over heavy from some workouts I had done the previous weekend for some training plans I am working on, so I didn’t think much of it. I was riding chase in the early singletrack with a couple folks a short distance behind and a larger line of folks in front that was slowly thinning out. I have to admit as well, that I was really wobbly in the singletrack for some reason. I immediately felt like my tires were too hard also and probably should have let some air out. I believe I gave up a spot in traffic in a tight section where I slipped and had to pull off and let somebody by. Then, on the 3rd bridge, I did exactly what Adam told us not to do, before he sent us off from the start line… and that was ride off the side of the bridge. It wasn’t too spectacular of a crash as I realized I couldn’t save it fairly early and had enough time to kind of catch myself going off the edge before completely going head over. I had to hike a bike across to the other side though and let a couple folks by before remounting again. I thought I might have drifted fairly close to the back of the race group at this point, but I just kept with my same steady effort. I felt like I was comfortable, right up until I got close to threshold. Any riding I have been doing has been at an endurance or tempo pace and I haven’t spent barely anytime above threshold since before the Marji Gesick. I could tell I was lacking everything at the very top end. I also started to realize that maybe my seat was too low, but I was back out on the wider trail and headed for the end of the lap and didn’t want to stop during the fast stuff. I started my second lap by riding off the dock… How often can you ride off a dock without getting wet. It was probably only about a 12 inch drop, but was fun anyways. I got back around another racer on the lake and then got caught up bad in the soft stuff near the end of the lake loop and got passed again. I went ahead and adjusted my seat higher here as well. This made a big difference. I think my seat had sagged down on me. I noticed the tape that I have on my tube to mark my seat height was wrinkled up. Anyways, my legs felt a little better with the seat up higher. At somepoint, early in the second lap or it might have been late in the first lap, I can’t remember. Anyways, I realized I hadn’t drank anything and then found my hydration pack with Carbo Rocket frozen up. Not a huge deal as I had drank some as I was waiting for the race to start. By this time, I knew I would be done racing in an hour and 30 minutes total. I tried a few times to reach back and shake it around, blowed in the tube, etc… but couldn’t get it to free up. I did have the pack and tube routed under my top layer and also had blown air back in it after my last drink at the start line, but it was still frozen. The rest of the second lap was fairly uneventful. I think I was clear of traffic immediately in front or behind me most of the second lap. I could usually always see somebody, but we weren’t wheel to wheel. Again, I just kept my steady effort and never really went on the attack, nor did I ever really back off. I think I might have swapped a spot or 2 back in forth in traffic at some point during the lap. The third lap was about the same as the second. I mostly was on my own, but could see folks in front or behind. I had made up a spot in traffic, but believe I lost one as well at some point. I could also start feeling the need for the water and maybe a little bit of fuel. I have found that I can usually get a hard workout done in an hour and half without fuel, as long as I have water. I think I got passed by somebody about halfway through this third lap as they had a good push going for the final stretch and I just didn’t have the legs for an extra push at the end and mostly stayed with my existing steady pace. Less than a mile from the finish, I was cruising through the wide path area and caught my front tire in a soft rut and had a pretty spectacular endo… or at least I thought it was. I did get to see my bike in the air above me, so I think that qualifies. It was a soft landing and I got back on the bike and kept going. Again, I think I had my tires a little too hard and probably should have floated over some of that soft stuff a little better vs getting caught up in it. I did give a little extra effort on the last couple of hills as I was bringing it into the finish line and ended up finishing 13th in 1 hr, 34 minutes and 17 seconds. I did enjoy this race and it was nice to get out to a low key event like this in January that I could race, but not feel like I needed to plan or prep for. I signed up for it just a few days ahead of time and headed over to the race about like I would for any general trail ride. I didn’t do any events like this last year and I think you’ll see me hitting up a couple more low key events like this or different races throughout the year to mix things up, keep me on my toes and sort stuff out before my target events arrive. I was winded at the finish line for a couple minutes from the very final push. If I am going to race all year, I may start including at least one short high intensity workout during the week, even in the off season or base periods. With how popular fat bike racing is becoming and how much fun it can be, it is starting to get a little blurry as to which time of the year the off season actually is. As I mentioned above, the Freezer Burn is part of a 2 race series that includes the Fat Vasa in Mora, Minnesota and I may end up going up to that race if I can work it out. In the mean time, I am keeping an eye on various events and will jump into some randomly if I can work them into my schedule. Otherwise, I have no races on my schedule until the Polar Roll. See what has been sent in the past.